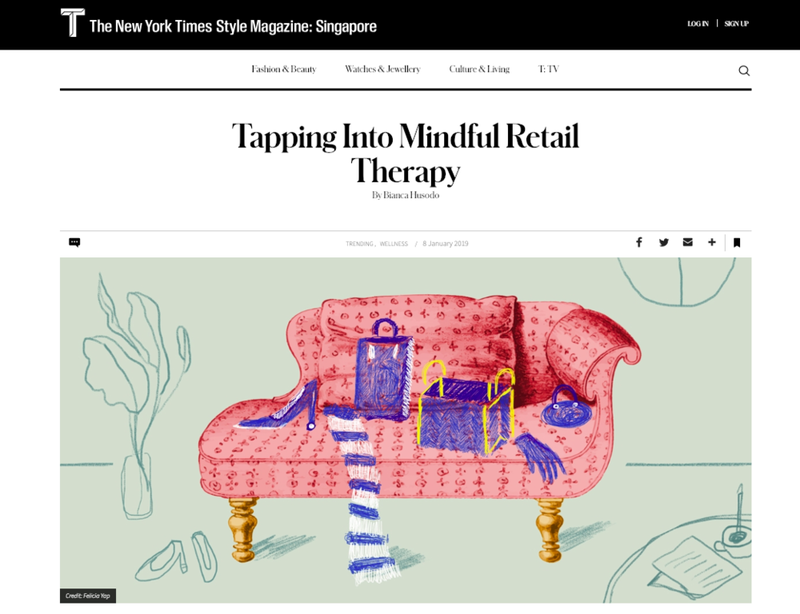 Anabel’s fashion psychology expertise and thoughts on the validity of retail therapy were featured in The New York Times Style Magazine: Singapore. Read here. Anabel’s theory around the undue feminist attack on Hedi Slimane’s Celine (from her Op-Ed for The Business of Fashion) was mentioned on Vogue Italia. Read here. Anabel’s theory around the significance of femininity in clothes in modern times (from her Op-Ed for The Business of Fashion) was mentioned on Vogue Spain. Read here. 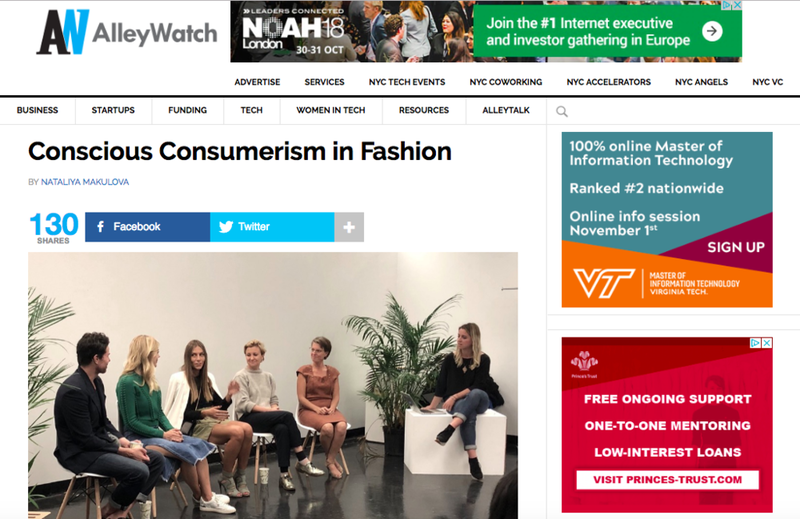 Anabel was a panellist at a Balanced Fashion event in New York City on September 27, focusing on conscious shopping along with other industry thought leaders in the ethical and sustainable fashion space. Read on Alley Watch. Anabel and The Psychology of Fashion were mentioned in "Meet The Style Shrinks". Read here. The Milan-based circular fashion platform profiled Anabel and The Psychology of Fashion on their Journal. Read here. 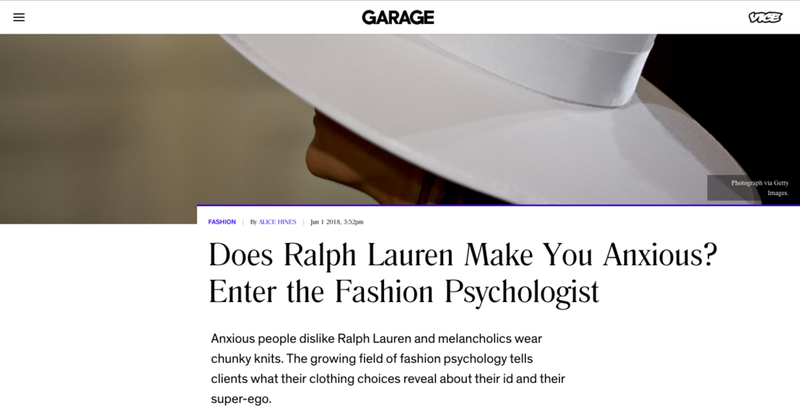 Anabel and The Psychology of Fashion were mentioned as part of a round-up of fashion psychologists platforms on GARAGE's online platform. Read it here. VC Investment Associate Tiffany Young, who publishes a blog focusing on female founders, interviewed Anabel, focusing on her fashion psychology work and start-up The Psychology of Fashion. Read here. 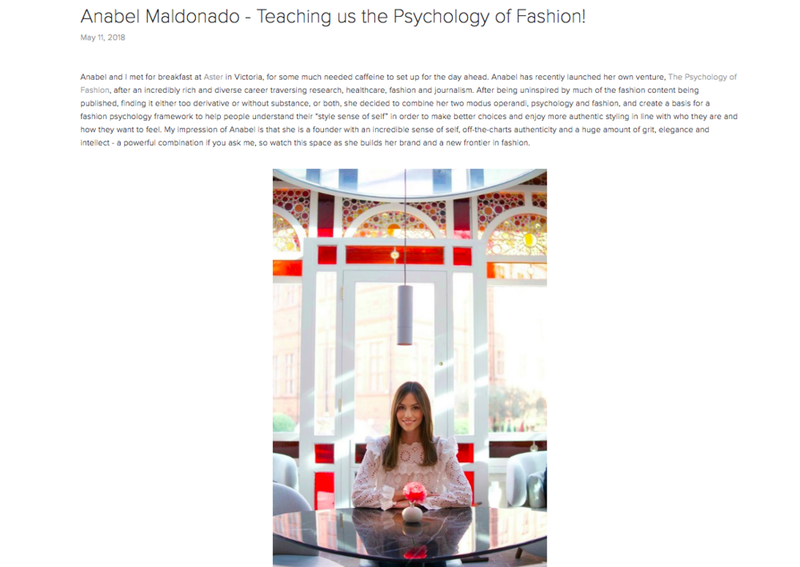 Anabel and The Psychology of Fashion were mentioned as part of a round-up of budding fashion psychology platforms on Julie Zerbo's site The Fashion Law. Anabel was interviewed by online lifestyle magazine SheerLuxe.com about her views on fashion psychology. Read it here. A video of Anabel after the Guy Laroche show at Palais De Tokyo as part of Paris Fashion Week AW16. Anabel is wearing a cashmere poncho by Chinti and Parker. Watch it here. Anabel as part of a street style video compilation after the Giambattista Valli SS16 show at the Grand Palais as part of Paris Fashion Week. Anabel is wearing a dress by Sandro. Anabel attends the opening party of London-based luxury shoe brand Bionda Castana's first shop in Belgravia. As a Founding Insider of luxury lifestyle site MyInsiders.com, Anabel provided her global travel recommendations. Anabel selected her favourite shoes and handbags from the Christian Louboutin sale for members-only shopping site Secret Sales. Click on image to view. Members-only luxury interiors site SecretSales.com featured Anabel's Notting Hill flat on their lifestyle blog. Click on the image to view article. Snapped by German Vogue after the Richard Nicoll show at London Fashion Week SS14, Anabel is wearing a sweater by Jacob, trousers by Topshop, Bonpoint coat, Valentino Rock Studs and bag by Louis Vuitton. Read Anabel's interview with LA-based fashion and lifestyle blog Tulle & Glitter to find out about her beauty routine, typical day and style picks - featuring Dolce & Gabanna, Tibi and Barbara Casasola. Click on the image to view article. Snapped by Harrods.com after the Richard Nicoll show at London Fashion Week SS14, Anabel is wearing a sweater by Jacob, trousers by Topshop, Bonpoint coat, Valentino Rock Studs and bag by Louis Vuitton. Click on image to be redirected to page. German fashion and lifestyle site snapped Anabel at Somerset House for London Fashion Week SS14 wearing a sweater by Jacob, trousers by Topshop, Bonpoint coat, Valentino Rock Studs and bag by Louis Vuitton. Snapped by photographer Wayne Tippetts for Street Style Aesthetic after Preen SS14 in front of the Natural History Museum. Anabel's dress is by The Kooples, blazer from Sandro, ankle boots by Kurt Geiger, Zara necklace. Click to be redirected to page. Taken for Nordstrom’s The Thread, after Isabel Marant SS15 outside the École de Médecine in Paris. Anabel's top is by Cos, shorts by Zara, watch by Michael Kors, sandals by Aldo. The clutch is vintage. Click on image to go to page. Taken for Nordstrom’s The Thread, after Isabel Marant SS15 outside the École de Médecine in Paris. Top by Cos, shorts by Zara, watch by Michael Kors, sandals by Aldo. The clutch is vintage. Click on image to go to page. Snapped by photographer Karl Edwin Guerre for Marie Claire after Preen SS14 in front of the Natural History Museum. Dress by The Kooples, blazer from Sandro, ankle boots by Kurt Geiger, Zara necklace. Click on image to go to page. Photographed in Notting Hill wearing a Jil Sander top, Zara skirt with vintage satin bow brooch, BCBG cardigan, Prada bag and Zara shoe-boots. Click on image to go to page. Photographed for Elle.com outside Bloomsbury Ballrooms after Clements Ribeiro AW13. Anabel is wearing a Max Mara coat, traditional Austrian shirt, H&M skirt, bag by Louis Vuitton. Click on image to go to page. 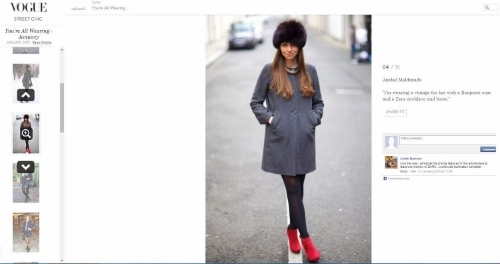 Photographed in Belgravia, London, Anabel is wearing a Bonpoint coat, Zara heels, vintage fur hat. Click on image to go to page. Photographed in Marylebone in a Topshop dress and necklace, sandals from Florence, bag by Louis Vuitton. Click on image to go to page. Photographed on Baker Street, London, Anabel is wearing a Topshop dress, Jil Sander top, Zara jacket and shoes, and Dooney & Bourke bag. Click on image to go to page. Photographed at the Vogue Festival in London outside the Royal Geographical Society, Anabel wore a camilla and marc dress, Sandro blazer, Prada clutch and Kurt Geiger ankle boots. Click on image to go to page.